The 9930ADC-AES75-RG 75-Ohm (Unbalanced) 4-Channel Analog-To-2-Pair AES Audio Converter with Remote Gain Control is a broadcast-quality Analog-To-Digital Converter (ADC) that converts four professional-level balanced analog audio inputs to a pair of AES-3id outputs. 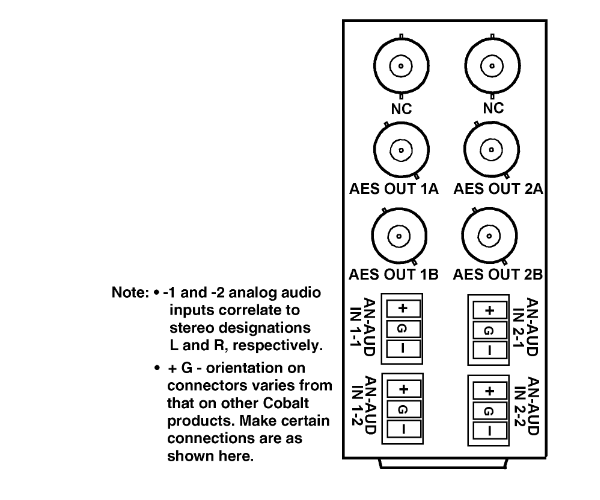 Each AES output is available over a 2x1 distribution amplifier. The 9930ADC-AES75-RG supports audio sampling frequencies from 32kHz to 96kHz using AES (DARS) reference, video black reference, or 48kHz internal reference (the AES sampling rate is determined by the reference selected). The 9930ADC-AES75-RG supports full 24 dBu input levels for outputs up to 0 dBFS digital. A built-in DSP allows mono-mix and L/R-only outputs. Input sensitivity trim for both pairs of analog inputs allows the input ADC to be tailored to professional as well as consumer levels, thereby maximizing ADC performance for any input level. The space-saving design and very low power consumption of the 9930ADC-AES75-RG provides for high density installation. You are currently requesting a quote for 9930ADC-AES75-RG.